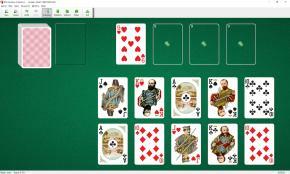 Sudden Death Solitaire uses two stripped decks (48 cards). 2, 3,4,5,6,7 and 8 of each suit is removed from the deck. You have 10 tableau piles and 4 foundations. One card is dealt to each tableau pile at the start of the game. Nines are moved to the foundations as they become available. 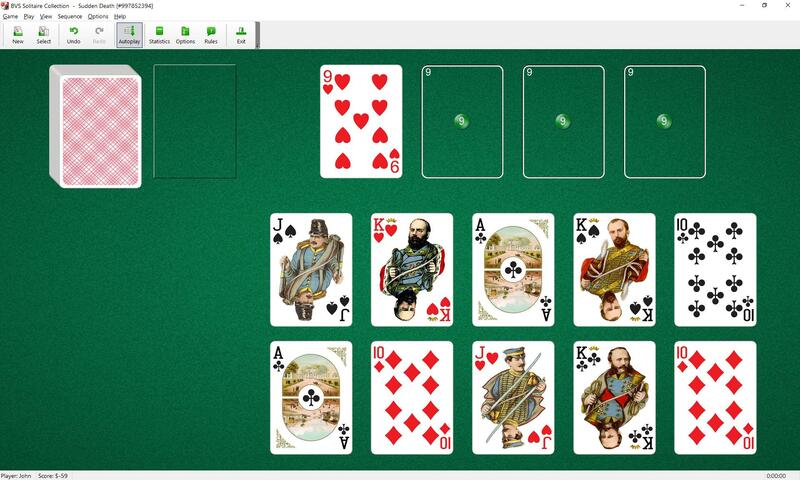 To build the foundations in ascending order from Nines to Aces and then in descending order in suit in the following sequence: 9, 10, J, Q, K, A, K, Q, J, 10, 9, A. You may build tableau piles up or down in suit, but you cannot change direction once a build is established. The top cards of tableau piles and the waste pile are available to play on foundations or tableau piles. Only one card at a time may be moved from pile to pile. Spaces are filled automatically from the stock or the waste piles. This game was invented by Albert H. Morehead and Geoffrey Mott-Smith.